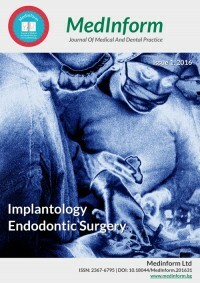 The aim of this study is to evaluate sinus floor elevation utilizing the lateral approach and simultaneous or stage implant placement as a reliable treatment of edentulism in the posterior areas of the upper jaw with vertical bone deficit. We considered as indicated for sinus floor elevation utilizing the lateral approach, patients, who had subantral bone deficit, which was caused by pneumatization of the maxillary sinus in cases with normal distance between the edentulous alveolar crest and the occlusal surface of the opposite teeth or to the occlusal plane. Patients were scanned via cone-beam computer tomography. The sinus floor elevation utilizing the lateral approach was performed with simultaneous implant placement or with stage implant placement. The following criteria were observed: presence of intraoperative and early postoperative complications, survival rate for the period of study, bleeding on probing, and marginal bone resorption. The observation period is 4 to 5 years. The survival rate of the implants placed simultaneously with the sinus floor elevation utilizing the lateral approach is 99.2%, as for the stage implant placement it is 100%. The mean period for stage implant placement is 5.28 months after the subantral bone augmentation. The simultaneously placed implants were loaded 4 to 5 months after the placement and the stage placed implants – after 6 months. Sinus floor elevation utilizing the lateral approach and simultaneous or stage implant placement, performed according to our methodology show high survival rate of the implants and high stability of the marginal bone.